Catchy? Of course! I've even been know to drop a Dougie, or two in a pinch, but now a days The Dougie is simply something that should be left behind like The Superman, or even The Macarena. I rejected it due to the impracticality of doing it in "da club". M-bone was devistated, and left Construx Castle a broken an dejected man. I never heard from him again, I hope he's OK I left him a few voicemails. What is actually on the horizon is anyone's guess. We all had fun doing the Dougie, but like most great things it's time is over. Keep your eye open for the "Ninja Wobble"
The future of dancing is now open for any creative mind, or talented performer. Being on the cutting edge of dancing is a hard job, but I consider it my commitment to you. Keep watching for developing trends, and now you are educated. Paul: We all know by now that regular kung-fu is played out. 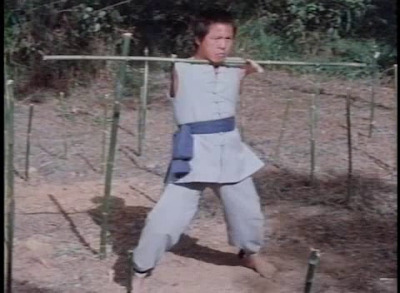 The fate of the first known combatant to face the Drunken Boxing style. A face you can trust, while he's kicking in your face. Why not? "Not again! You construx doods r too too Much-aaaaahhhhhhhhhh!!"